Regardless of the time of year, it’s always a good time to think about going swimming. In the summertime you need to find a way to get out of the heat, and winter is a great time to start making plans for the summer, especially since you’ll be able to find great deals on pools. If you’re thinking about getting a swimming pool for your home, an above-ground pool is a great option. You’ll save money and hassle, since there is no need to have a contractor dig in your yard and then install the pool. Your property value will remain unchanged because, again, no giant hole in the yard. And an above-ground pool has the benefit of being portable; when you move, you don’t need to call in a new contractor, just break down the pool at your old house and set it up again when you get to the new one. Here are some things to look for when picking the best pool for your needs. Ultra Frame: While all above-ground pools are portable—they can all be broken down and taken with you when you move—ultra frame pools are the closest ones you’ll find to being permanent fixtures. They tend to be the biggest and sturdiest models on the market, and also the most expensive. An ultra frame pool is definitely an investment in money, installation time, and yard space, but if you’re serious about swimming, it might be an investment worth making. Frame: Think of these as semi-permanent pools. They tend to be a bit smaller than ultra frame models, which means that they also tend to have fewer parts to install, set up and break down a bit faster, and, of course, save their owners some money. Inflatable: The most portable of all of the options. 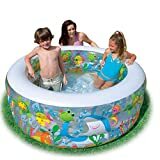 Inflatable pools set up and tear down faster than any of the other options, and they have the fewest parts to keep track of. Inflatable pools can potentially be less durable than other types, but the best models are made from sturdy materials and offer buyers a good pool at a low price. Durability: Since an above-ground pool is designed to be installed and then left in place, at least for a while, it is important that it is made of durable, long-lasting materials that can stand up to different weather conditions. Installation: Putting up an above-ground pool will probably take a bit of work (unless you opt for an inflatable version), but it shouldn’t be an ordeal. Great pools come with clear instructions as well as all the parts you’ll need to get the pool up and running. Maintenance: Just like any pool, your above-ground pool will need to be maintained. 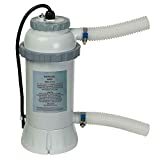 Higher-end models come with pumps and filters to keep the water clean, and that’s great, but there are plenty of good, less-expensive pools that can be maintained with store-bought cleaning materials and a bit of work. Size: When shopping for a pool, you’ll obviously want to keep the amount of space you have in mind; you don’t want your entire yard taken up by a pool. You’ll also want to think about the number of swimmers that you have in your house, as well as the number of people who you might want to invite over for a swim—if you have a couple of kids at home, chances are that number will grow a bit during the summer when the pool is in use, so buy accordingly. Installation: When shopping for a pool, take a look at how it will need to be installed and ask yourself if it is a project that you (and probably a few friends) can handle. If not, you might want to look for a different model or seek out professional help for the installation. Depth: You won’t be diving in your above-ground pool—it won’t be deep enough for that—but will you be swimming, or wading, or just sitting around in the cool water, or some combination of those? If you’re only planning on sitting in the pool (like a cool version of a hot tub), then you probably don’t need to buy a pool that’s deep enough for swimming around. Price: Think of your above-ground pool as an investment for your relaxation. If you want to go with a bigger, sturdier model, just know that you’re going to need to commit a bit more money to it. If you want something more modest in terms of price, then go with a smaller model. 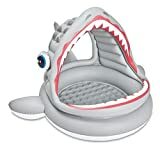 Intex: Intex has been making inflatable products (including pool toys and even inflatable furniture) for over forty years. Since 1997, they have also been making above-ground swimming pools. They are recognized as one of the top companies in the market, and they offer both inflatable and framed pools to customers. Bestway: Like Intex, Bestway specializes in inflatable furniture and swimming pools. The company was founded in 1994, and today has manufacturing facilities and branch offices on five continents. Splash Pools: Splash Pools is a family-owned company that has been producing and selling above-ground pools as well as pool maintenance supplies and equipment since 1986.